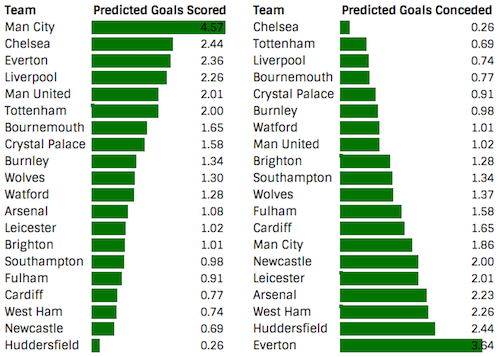 Each week we will be reviewing the aggregated predictions on Superbru’s Premier League Predictor game, using the collective Wisdom of the Crowd predictions to guide our fantasy football thinking. Please join the FFS league here and add your own predictions to the data – the more there are, the more accurate the crowd should be (in theory). And don’t forget there is £50,000 in prize money on offer every week. We must all make predictions about how each match will go when deciding on our fantasy team selection, predicting where the goals will be scored, which teams are most likely to keep a clean sheet and so on. If we aggregate the predictions of thousands of football fans playing the Premier League Predictor game on Superbru, any bias should be ironed out, and the collective knowledge will produce more accurate predictions that we can make on our own. We tested this last season by taking the average community predictions, and entering them into the game as a user called Mr Crowd Wisdom. That user finished in 20th place out of 481 people in the Fantasy Football Scout league – a highly knowledgeable group – and also beat 98% of other people on the global leaderboard. We’ll follow the average picks again this season and hopefully it will provide another reference point for your fantasy team selections. It was a great week for the Mr Crowd Wisdom, with 5 correct predictions beating the community average of just 3.98. That included two Exact Score picks and two Close picks, resulting in green arrows on the global leaderboard. With a double gameweek, Man City are far and away at the top of the predicted goals chart. City are expected to score two more goals than the next highest team. If anyone knew which players would start both games, they’d be the ideal captain choice! Despite two home matches Everton are only third in predicted goals, with Chelsea ahead of them thanks to their home tie with Huddersfield. In defence, Chelsea appear likely to keep a clean sheet, with Bournemouth, Crystal Palace and Burnley offering the budget-friendly defender options. Here are the picks we’ll enter for Mr Crowd Wisdom this week. He's flagged the whole day. The crowd isn't predicting the number of clean sheets. It's predicting the most likely score in each individual match. How much is a free hit worth? Would you FH for gw 27, if you had this team for gw 26? i have gone sterling. seems like the chances of an explosion may be higher with him. c) What is this Siggy nonsense? Have two FT's and only Rich and Ederson (and Digne) from the DGW teams so I could do something about it but not sure how to proceed. Could recover for the blank by switching Aguero or KDB (depending on the performances) or Rich (but probably not) back to someone else. I do think DGW's are a bit overrated but at the same time I don't feel extremely confident about Lingard/Haz/Rash either so I dunno I dunno! As someone with no City, I'd just about take those scorelines. The Bookies take a more sanguine view; they think City are out for blood. But City haven't been themselves lately, and big teams often underperform in DGWs. Sarri says he is going to stick with the same tactics until his players play them well. I'd be more worried if he decided to abandon his philosophy, to be honest.